Ten Key Club members made the long trip from Carson City, NV (CNH Division 45) to help decorate floats for the Kiwanis Rose Float Club (sponsored by Kiwanis club of Carson City) They worked with crew chief Steve Varma and his assistants Mary and Sharon on the LifeSource Water System's float for two days over four shifts. The Carson High Key Clubbers had a rare opportunity for service in Pasadena on New Year's Day. 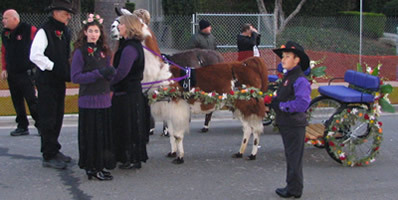 They helped decorate the llama carts for the Llama Association of Southern California's entry in the Tournament of Roses Parade.It was the first time that were llamas had been included in the parade and a first for the Key Clubbers to provide this unique service. 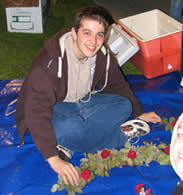 Sharon asked the Key Club members to help with the llama decorations the morning of the Rose Parade. Participants moving out to the start of the parade route.